There are so many perfect destination wedding spots in the Caribbean but this one stands out from the crowd. Sandals Resorts is known for unique Caribbean weddings and even they have upped the level of elegance with their new over the water wedding chapel. Even better you can have your wedding here for free. Yes free, but of course you have to book a vacation package to get these nice extras and we can get you all the details. This over the water wedding chapel can fit up to 20 of your guests and the setting is to die for. The exclusive Sandals chapel is set directly over the stunning Caribbean ocean and also offers views of the horizon while glass panels let you peek at the life below. 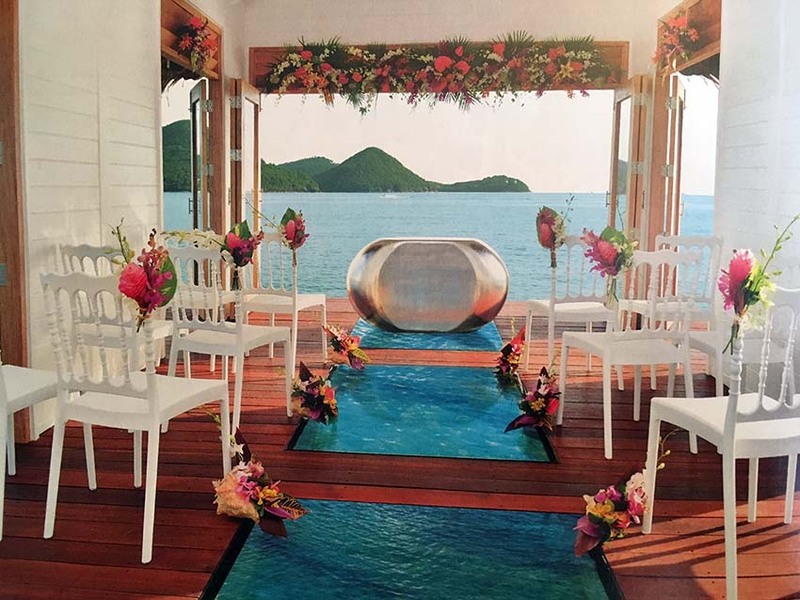 To reserve this over the water wedding chapel you need to stay at Sandals Grande St. Lucian, or if Jamaica is more your style check out Sandals South Coast. A wedding here is more affordable than you might think and also it allows you to go right from the wedding to your all-inclusive honeymoon. Start Planning Your All-Inclusive Vacation Today! Get a quote and start planning your All-Inclusive Vacation, Wedding or Honeymoon today.